Sheriff Darrell Young addresses the crowd. 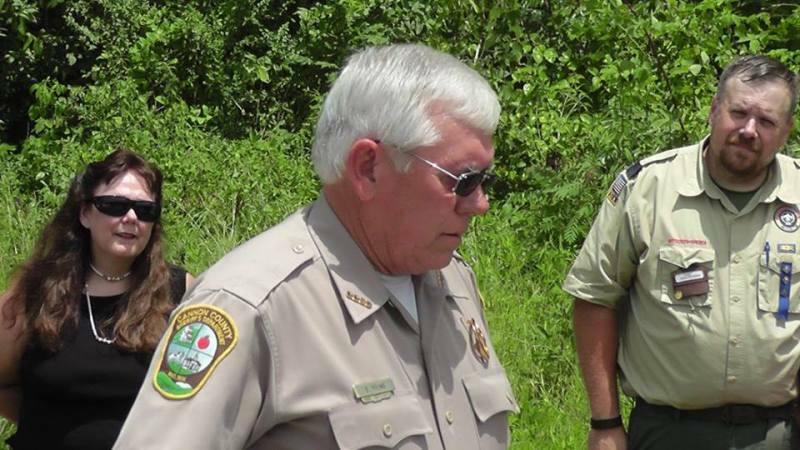 Leaders, family gathered Saturday (June 13) to officially name the newly-completed Cannon County portion of State Route 70S in honor of the late Deputy Ira Darby Prater. The ceremony was held near the Cannon/Warren County line. Among those attending were Darby's brother Shane who is an corporal with the Smyrna Police Department, his mother Robbie Prater, wife Sheryl Prater and children Maddy, Riley and Reagan Prater. It was Shane Prater who began the process of naming the new section of highway after his late brother. "I would like to try to have the new highway project for US Highway 70 in Cannon County named in honor of him. I am unsure of the process and would be grateful for any assistance you could provide in this manner," Prater said in a letter to state Rep. Mark Pody. The Prater family has deep roots in the area. "We grew up in the Centertown area of Warren County and I also served as a Deputy Sheriff in Cannon County. My family roots are in Cannon County as my sixth Great-Grandfather Nathan Neely gave the land for the town then named Danville (later changed to Woodbury) to be built on. My other Great Grandfather Archeleous Archibald Prater was also one of the earliest settlers in the Parchcorn area around 1806," Prater said. His brother, Cannon County Deputy Prater died Jan. 8, 1996 in an auto accident on icy Dickens Hill. He is to this date the only officer in Cannon County to die in the line of duty. He was 22-years-old and had only recently become a full-time deputy. The residents of the Bradyville area had no electricity or heat and the deputy was checking places and houses along the roadways of southern Cannon County. The road was very slick with ice and packed snow when Deputy Prater attempted to climb Dickens Hill. Prater, who had just graduated from the Tennessee Law Enforcement Training Academy in Donelson less than a month earlier, lost his life when the patrol unit he was driving could go no further up the treacherous hill and started sliding backwards down the steep embankment and over the edge into the trees below. When his radio went silent, authorities responded with the Cannon County Rescue Squad and Emergency Medical Service leading the way. Prater was pronounced dead at the scene of the accident. Saturday's event featured a welcome by Sen. Mae Beavers with Chaplain Ric Lee leading the group in prayer. Remarks by Rep. Mark Pody followed with a flag presentation by Cub Scout Pack 1180, led by Scoutmaster Josh Rinehart. American Legion Post 279 Commander Charlie Harrell led the audience in the Pledge of Allegiance, followed by remarks by Cannon County Commissioner Glenn Steakley and Sheriff Darrell Young. Shane Prater made remarks for his family members following a presentation to the family by Senator Beavers and Representative Pody. The new sign, naming the stretch of highway after Deputy Prater was unveiled by officers from the Cannon County Sheriff's Department.